Republic Institute for Protection of Cultural Heritage has launched a project for the repair of the chapel of St. Andrew the First Called in the Royal Compound in Dedinje and on the 15th of August 2012 the contract for construction works is signed with “Ornament Investinženjering” from Belgrade. 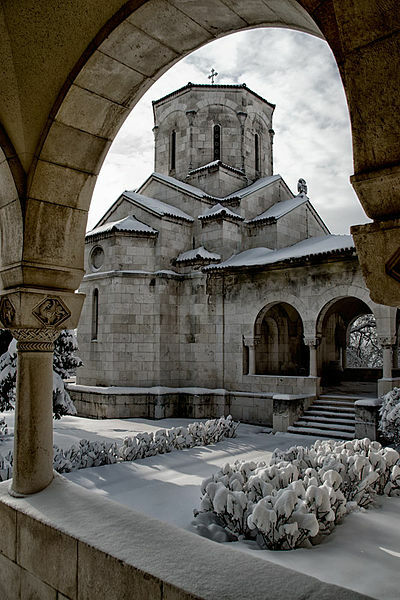 “Ornament Investinženjering” Belgrade is one of the qualified companies for executing work on monuments of culture, and have recently implemented and repaired the roof and facade of the church – Memorial ossuary in Lazarevac. Within the Royal Compound in Dedinje, a family church is located on the south side, and it is connected to the main building through the porch with columns. The temple is dedicated to St. Andrew the First Called – the patron Saint of the family Karadjordjevic. The model for the construction is the church of the monastery of St. Andrew on the river Treska in Macedonia, which was built in 1389. by Andrew, the son of King Vukasin The church was designed and built at the same time as the main building. The painting of the church was done according to cardboards and drawings prepared by a team of artists from the Association of artists of Belgrade. Following the order of King Alexander The First, this group has visited most of the Serbian medieval monasteries with the mission to transfer (copy) frescoes and biographies on the cardboards. The academician Nikolai Krasnov was the organizer. After performing the preparation of the walls, the matching cards and drawing, the definitive decision was made by King Alexander I of the Karadjordjevic family. The painters who are chosen for the imaging of biographies in the church are Boris Obraskov, Nicholas Meyendorff, Vladimir Bickovski, Rejtlinger and Eugene Varun-Sekrat.